Chen Duxiu (陳獨秀) (October 8, 1879 – May 27, 1942) Wade-Giles romanization Ch'en Tu-hsiu, original name Ch'en Ch'ien-sheng, was a Chinese educator, philosopher, journalist and political revolutionary. Although he was successful in the traditional Confucian system of examinations, he quickly became a critic of traditional values and an outspoken advocate for modernization and change. Four times during his life he was forced to flee to Japan to escape the persecution of the conservative authorities. In 1915 he established the influential newspaper New Youth, to promote the use of vernacular Chinese in literature and introduce the Chinese people to new ideas such as individualism, democracy, humanism, and scientific methods. Many of those who contributed to the monthly, including Hu Shih, Lu Hsün, Li Dazhao, and Mao Zedong, later became important intellectual and political leaders. Chen was a founder of the Chinese Communist Party (1920) and was selected as its first Chairman, and first General Secretary, remaining its undisputed leader for seven years until he was ousted for opposing the policies of the Comintern. October 15, 1932: Arrested by the Kuomintang; in 1933 sentenced to 13 years in prison. Chen Duxiu was born October 8, 1879, in the city of Anqing (安慶) in Anhui (安徽) province, to a wealthy family, the youngest of four children. His father, who was an official in the military office in Manchuria, died before Chen was a year old. Chen was raised by his mother and received almost no formal education, but his grandfather, followed by several private tutors and then his brother, tutored him in classical Chinese literature, especially the Four Books (四書) and the Five Classics (五經). A thorough knowledge of these literary and philosophical works were the prerequisites for civil service in Imperial China. Chen was an exceptional student, but this lack of formal education resulted in a lifelong tendency to advocate unconventional beliefs and criticize traditional ideas. In 1896, Chen took and passed the county-level imperial examination with honors in Huai-ning, and the next year passed the second level in Nanking, but he failed the provincial-level examination (省試) the year after that. His experiences with these examinations convinced him that the traditional Chinese systems of education and government were irrelevant for the twentieth century, and inspired him to become a social and political reformer. He entered the Ch'iu-shih (“Truth-Seeking”) Academy in Hang-chou, where he studied French, English, and naval architecture. In 1901, after delivering speeches against the Manchu government in his home province, Chen was obliged to flee to Nanking, and the next year he went to Japan and enrolled in the Tokyo Higher Normal School. In Japan he encountered the growing Chinese dissident movement and became influenced by western socialism. At the turn of the century, the Qing Dynasty (清朝) had suffered a series of humiliating military defeats at the hands of the colonial foreign powers, the First Sino-Japanese War (1894-1895) and the war against the Alliance of Eight Nations in the 1901 Boxer Rebellion. At the same time, widespread corruption within the Qing bureaucracy had left the empire in a state of economic paralysis. Against this background, Chen Duxiu became an increasingly influential activist in the revolutionary movement opposing both foreign imperialism and the Qing government itself. Chen returned to China in 1903 and founded the Anhui Patriotic Association (安徽愛國會). He participated with some friends in establishing the subversive Kuo-min jih-jih pao (“National Daily News”) in Shanghai, which was quickly suppressed by the authorities. In 1904 he went to Anhwei and began publication of Anhui Suhua Bao (安徽俗話報), a journal in vernacular Chinese to promote participation in politics and modernization in China. In 1905 he founded the Yuewang Hui (岳王會). The same year he returned to Japan to study at Waseda University, but after a few months returned to teach high school in Anhwei and establish another periodical. While in Japan he rejected membership in the revolutionary party established by Sun Yat-sen because he did not accept its emphasis on nationalism. According to some reports, he went to study in France the following year and became an admirer of French culture. In 1910, Chen visited Manchuria before taking a post as a teacher at the Army Elementary School in Hang-chou. He was an outspoken writer and political leader by the time of the Wuchang Uprising (武昌起義) of 1911, which led to the abdication of the last Qing emperor and the collapse of the Qing Dynasty. After the establishment of the Republic in 1911, Chen became secretary general to the military governor of Anhwei province and dean of the provincial higher normal school. After taking part in the unsuccessful second revolution against President Yüan Shih-k'ai in 1913, he fled to Japan, Chen fled to Japan again in 1913 After participating in the short-lived "Second Revolution" of Yuan Shikai (袁世凱) in 1913, Chen fled to Japan again, where he helped to edit Chia-yin tsa-chih (“The Tiger”), a liberal Chinese magazine calling for political reforms. In 1915, Chen started an influential monthly periodical in Shanghai, The Youth Magazine (青年雜誌), which was renamed New Youth (新青年) and subtitled La Jeunesse from 1916 to 1919. In 1917, Chen was appointed dean of the School of Letters at the Peking National University. Many liberal and progressive professors and students gathered around him, and with their help, he established the short-lived radical Mei-chou p'ing-lun (“Weekly Critic”) in December 1918. The literary and philosophical ideas of this group dominated the May Fourth Movement, a massive student protest in 1919 against the Chinese government's weak stance at the Versailles Peace Conference, which awarded Shantung to the Japanese. Chen was forced to resign his post because of his involvement and was imprisoned for three months, from June to September 1919. Chinese historians have generally asserted that Chen, Li and the other Chinese radicals of the time (including future chairman Mao Zedong) formed the Chinese Communist Party after diligent study of Marxist theories, inspired by the Russian Revolution of 1917. However, it has become apparent that at the time when the CCP was founded, Chinese radicals, including Chen, were not fully conversant in Marxist ideology; some of them were more or less anarchists, and several of the prominent members at that time did not understand the fundamental premises of Marxist theory. Because of severe persecution and failed attempts at a more anarchistic social revolution, these prominent Chinese revolutionaries eventually turned to communism, and were organized through the influence of a Comintern advisor, Grigori Voitinsky, who made a tour of China during 1920-21. At the First Congress of the Communist Party in Shanghai, Chen was elected (in absentia) as the party's first Secretary General, and remained the party's undisputed leader for seven years. With the assistance of Li Dazhao, he developed a co-operative relationship with the international communist movement, the Comintern. This co-operation with the Comintern proved to be a problem for the fledgling Chinese Communist Party (CCP) over the next decade, as aggressive foreign Comintern advisors tried to force party policy to conform to the wishes of Moscow against the will of many prominent CCP leaders. At the direction of the Comintern, Chen and the Chinese Communists formed an alliance with Sun Yat-sen and the Nationalist Party (中國國民黨, the Guómíndǎng, or the Kuomintang) in 1922; almost every prominent member of the Chinese Communist Party opposed this decision. China had disintegrated into an era of violent warlordism following the Wuchang Uprising, and the Nationalists were attempting to re-unify the nation under a Republican government. In January of 1924, Chen was elected to the Central Committee of the Nationalist Party. However, Chen became increasingly disillusioned with the Nationalists, which he perceived as rivaling the Qing dynasty in corruption. He also resented the foreign influence of the Comintern over the Chinese Communists. In 1925, when the right wing of the Nationalist Party began to attack, Chen repeatedly proposed that the Communists withdraw en masse from the Nationalist Party, but the Comintern refused. In 1927, when the alliance failed, Chen was made a scapegoat and forced to resign his position as Secretary-General for his opposition to the Comintern. In 1929 he was ousted from the pro-Comintern CCP. 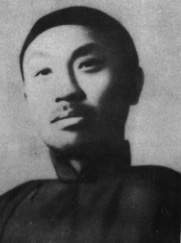 Chen became associated with the International Left Opposition of Leon Trotsky. Like Chen, Trotsky opposed many of the policies of the Comintern; Trotsky publicly criticized the Comintern's effort to collaborate with the Nationalists. Chen eventually became the voice of the Trotskyists in China. On Oct. 15, 1932, during the anti-Marxist purges of President Chiang Kai-shek (Jiǎng Jièshí, 蔣介石, or 蔣中正), Chen was arrested by the foreign administration of Shanghai and extradited to Nanking, where he was tried and sentenced to 15 years in prison by the Nationalist-controlled government. After the Sino-Japanese War began, he was paroled in August, 1937. Chen’s political organization had been shattered, and the Chinese Communist Party had been almost destroyed in the purges. Both the supporters of Chen and the pro-Comintern leaders who opposed him had been either killed or fallen out of favor with the Communist membership. The Chinese Communist Party survived the purges by fleeing to the northern frontier in the Long March of 1934, under the leadership of a new party chairman, Mao Zedong. Mao and the new generation of communists would lead the party in China for the next 50 years. For the last two decades of his life, Chen moved from place to place and in 1938, he arrived in the wartime capital, where he taught at a junior high school. Chen later embraced liberalism, and refused to side either with the Nationalists or the Chinese Communist Party. Chen Duxiu died in 1942 at the age of 62 in Chian-ching, Sichuan province, and is today buried at his birthplace of Anqing. An inveterate revolutionary, Chen rejected China’s traditional Confucian values and dedicated himself to the realization of a new, modernized society in which people could think for themselves, and a person’s value was not determined by his social status. The period of Chen's greatest influence on Chinese thought and politics began in 1915, when he gathered young intellectuals around him and established the monthly Ch'ing-nien tsa-chih (“Youth Magazine”) in Shanghai, later renamed Hsin ch'ing-nien (“New Youth”). Many of those who contributed to the monthly, including Hu Shih, Lu Hsün, Li Dazhao, and Mao Zedong, were later to become important intellectual and political leaders. Chen not only sought political change, but modernization in science, literature and culture. He regarded Marxism as a means to achieve a “mass democracy” based on the millions of common laborers, but opposed the Comintern-ordered policy of armed insurrection and appreciated the importance of the bourgeoisie in the Chinese revolution that he hoped to achieve. During the last years of his life, Chen denounced Stalin's dictatorship and defended such democratic institutions as an independent, nonpartisan judiciary, opposition parties, the free press, and free elections. Chen made many contributions in the field of Chinese journalism, helping to pioneer the use of journals and newspapers to educate the general public and stimulate discussion among intellectuals. He insisted on exposing the truth to the Chinese people, creating a tradition of outspokenness and debate. By establishing newspapers and magazines concerning political issues, Chen gave a voice to the general public, so that they could express their ideas and their discontent with the existing government. Chen believed that the purpose of mass media is to reveal the truth. At a young age, Chen had already established Guomin Ribao (國民日報), promoting the inefficiency of the Qing Dynasty. Chen felt his articles must reflect the needs of society, and believed that society cannot progress without those who accurately report social weaknesses and problems. Chen's articles were always expressive. He criticized the traditional Chinese officials as corrupt and guilty of other wrongdoings. He was under constant attack and frequently persecuted by conservatives, so that he had to flee to Japan four times. Chen's articles strove to attract publicity, and often aroused discussion by using hyperbole. For instance, he emphasized his sadness about the backwardness and corruption in China, so that suffering people would be willing to send him their opinions. In the “New Youth,” he even wrote different articles, using different nicknames, to create a ‘discussion’ which would arouse public sentiment. Chen's newspapers emphasized responses from his audience with features such as the forums and citizens' columns in New Youth. There was an average of six letters from the public in each publication. Whether in praise or strong opposition, Chen encouraged everyone to write. He also thought that teamwork was very important in journalism, and asked for help from many talented authors and journalists, including Hu Shih and Lu Xun. On March 31, 1904, Chen founded Anhui Suhua Bao (安徽俗話報), a newspaper that he established with Fang Zhiwu (房秩五) and Wu Shou (吴守) in Tokyo to promote revolutionary ideas using vernacular Chinese, which was simpler and easier for the general public to read. While Chen was the chief secretary of the newspaper, the circulation increased from only a thousand copies to more than three times that figure in less than half a year, to become one of the most popular vernacular Chinese newspapers. During 1904 and 1905, a total of twenty-three periodicals were published. Each had 40 pages - about 15,000 words. However, due to political pressure, the paper was barred from publication in 1905. To let his villagers (Anhui) keep abreast of the politics of the Qing Dynasty. To educate the readers by using vernacular Chinese. To promote revolutionary ideas to the public. Chen found out that Chinese often placed their families before their country, and most of them were, in his opinion, too superstitious. Through the publication of Anhui Suhua Bao (安徽俗話報), Chen tried to urge Chinese people to participate in politics. After the sixteenth publication, the newspaper added an extra sixteen topics, including the military, Chinese philosophy, hygiene, and astronomy. Almost all of the new topics were written by Chen, whose pen-name was San'ai (三愛); at least 50 articles were published under this name. In early 1914, Chen went to Japan and became an editor and wrote critical articles for the Tokyo Jiayin Magazine (甲寅雜誌) founded by Zhang Shizhao (章士釗). Chen once wrote an article entitled "Self consciousness on patriotism" (愛國心與自覺) which conveyed a strong sense of patriotism and incited people to fight for their freedom. It spread the idea that those who love their country would spare no pains to protect that country and strive for the rights which the people deserve. This group of people should work together harmoniously towards the same goal. The article was a threat to the central government, as it tried to arouse the self-consciousness of the Chinese people. This preliminary magazine was released for a total of ten issues before it was stopped from publishing. The magazine was resumed in 1925 in Beijing with the new name "Tokyo Jiayin Weekly" (甲寅周刊). In 1915, Chen started an influential monthly periodical in Shanghai, The Youth Magazine (青年雜誌), which was renamed New Youth (新青年) and subtitled La Jeunesse from 1916 to 1919. Chen was the chief editor of this periodical, which was published by Qunyi shushe (群益書社) and stopped in 1926. The magazine mainly advocated the use of plain language, socialism and Marxism, and was strongly against feudalism. In 1918, New Youth published some new poems of Hu Shih (胡適) and Liu Bannong (劉半農), which were written in vernacular Chinese. Later, all the articles in New Youth were written in vernacular Chinese with new punctuation, and New Youth became in pioneer in the movement to use vernacular Chinese in literature. 1915 to 1918: it opposed the Chinese conservatism (Confucianism) and promoted the development of democracy, and became the center of the New Culture Movement. 1921 to 1926: it became the theoretical base for the Communist Party. The Shanghai local government banned the sale of Guomin Ribao (國民日報) on December 1, 1903. After this, Chen twice planned to found Aiguo Xinbao (愛國新報), but failed because of pressure from different groups. Chen continued to express his discontent with the government, for instance, becoming responsible for all editing and distribution when Anhui Suhua Bao (安徽俗話報) was published on March 31, 1904. On November 27, 1918, Chen started another magazine, the Weekly Review (每週評論) with Li Dazhao(李大釗) in order to criticize politics more directly and to promote democracy, science and new literature (baihua). Later, he founded New Youth (新青年), known for its argumentative essays. He also edited Tokyo Jiayin Magazine (甲寅雜誌) and Science Magazine (科學雜誌). Later, he became the Editor-in-Chief of Minli Bao (民立報) and Shenzhou Daily (神州日報). From 1908 to 1910, students at Beijing University, particularly Deng Zhongxia (鄧中夏) and Xu Deheng (許德珩) founded the Guomin magazine (國民雜誌) and invited Li Dazhao (李大釗) as consultant. From 1912 to 1913, Chen asked for assistance from Luo Jialun (羅家倫) and Fu Sinian (傅斯年) and they founded Xinchao She (新潮社). In the second edition of New Youth, when Chen published Cai Yuanpei's Speech of Freedom of Religion (蔡元培先生在信教自由會之演說), Cai Yuanpei criticized Chen for misinterpreting of his speech, saying, "The publication of my speech on New Youth committed a number of mistakes." Fortunately, Cai did not become angry with Chen and the publication was amended before going to press. Chen had another disagreement with Hu Shih, over the political stance of New Youth. Hu Shih insisted that New Youth should be politically neutral and the publication should be more or less concerned with Chinese philosophy. However, Chen attacked his rationale by publishing "Politics Talk" (談政治) in the eighth edition. 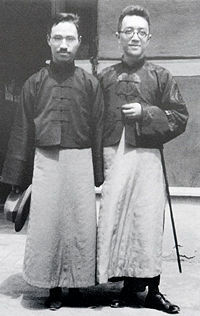 At that time, Chen was invited by Chen Jiongming (陳炯明) to be the Education officer in Guangzhou in mid-December of 1920. He decided to assign responsibility for the publication to Mao Dun (茅盾), who belonged to the Shanghai Communist Party. This displeased Hu Shih, and their partnership dissolved. Chen introduced many new ideas such as individualism, democracy, humanism, and scientific methods to replace Confucian values in Communism. In the first issue, Chen called the young generation to struggle against the Confucianism by "theories of literary revolution" (文學革命論). Chen called for the destruction of tradition, and his attack on traditionalism opened a new vista for the educated youth. New Youth magazine became the seed of the May Fourth Movement. It preached orthodoxy of thought, with total disregard for freedom of thinking and expression. All links retrieved February 9, 2016. Chaolin, Zheng. Chen Duxiu and the Trotskyists. This page was last modified on 9 February 2017, at 19:24.